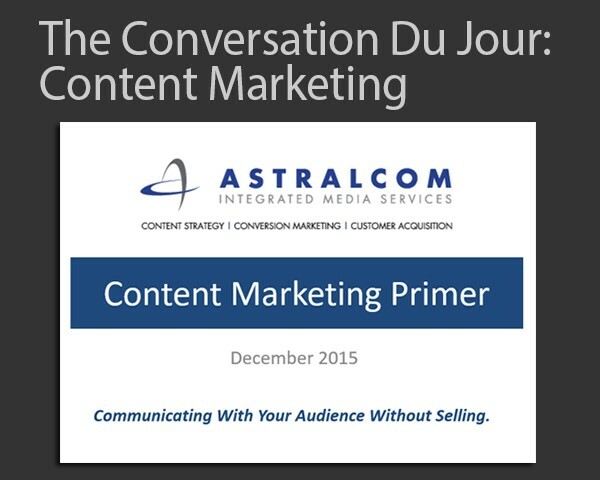 Content Marketing: The Conversation Du Jour | ASTRALCOM - Content Strategy, Conversion Marketing and Customer Acquisition. Like any new thing, it takes a while before the overall market begins to embrace it. Sometimes, through a combination of ingenuity, evolution and timing, it becomes a necessity. With the conversation du jour centering around content marketing, it’s begun to interest many C-level executives, especially among our client base. Is content marketing for real? Is it actually something new? Frankly, we’ve been doing content marketing for 20 years, only we’ve been calling it “messaging.” Read any of our posts going back thru our company history and you’ll see messaging as a contextual term in nearly every post. The real difference is in how this messaging/content is being consumed today, vs any other time in history. It’s because of the diversity in medium and context that content marketing has come to the forefront. As it should, because with so many points by which to connect with and engage consumers, content touches all of them. It is at these very touchpoints that content begins to affect the buyer journey. Like many of our clients are asking, you probably are, too: What exactly is content marketing? How is it done? Is it necessary? Answers to those questions and more are contained in our Content Marketing Primer. The Primer is a quick general overview with some solid nuggets of info that will help you get your content game on. Check it out and then give us a shout at 800.536.6637 and let us know how you plan to use the concepts in the Primer.